Discover how Peyton and classmates used these tools to enhance their personal growth and development. All undergraduates who attend a semester program will participate in the CIMBA Advantage Program (CAP). The CAP program is a series of lectures and events which capture the spirit of CIMBA and are focused on CIMBA’s goals, basic beliefs, and cultural exploration. Many of these meetings will take place within the first two weeks you are on campus to help you adapt to your time abroad. Others will be spaced throughout the semester. The semester CAP events are listed below; those marked with an asterisk are optional. During this session, you will be introduced to the innovative technology that is available at CIMBA through our Leadership Institute. 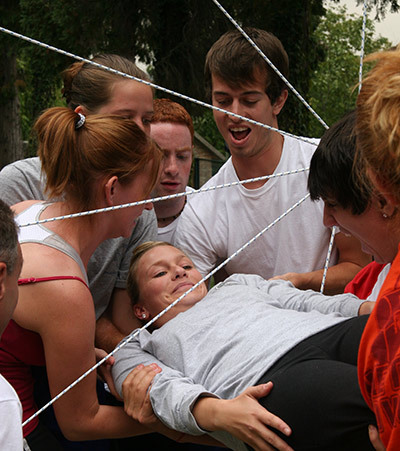 You will participate in a low-ropes course team building activity. All students will receive an introduction to KT PSDM methodology which is well respected and widely used in corporations around the world. If you would like to earn a certificate in KT PSDM, you can attend addition sessions. Click here for more information regarding KT PSDM. You will attend one of these sessions, depending on whether you are enrolled in LIFE or not. These orientations will give you a basic understanding of the neuroscience behind the relationship between behavior and performance. You will learn about Italian companies and business practices first hand when you visit local area companies and talk with their executives. You will learn about living and working abroad from a panel of expatriates who share their experiences about living and working in Italy. You will have opportunities to ask questions and interact with the guest speakers. Offered at the beginning of the semester, this session offers tips for balancing your time while in Italy and managing different commitments (academic, travel, social, family). We provide you with the opportunity to learn the basic do’s and don’ts of interviewing. This session is followed by optional interview practice with our staff and professionals to further hone your skills. This workshop teaches you basic tips for effective public speaking. This session is followed by an optional opportunity to practice speeches and presentations in front of an audience while receiving feedback for continual improvement. This session will teach you how to better utilize your online profiles, such as LinkedIn, to help with your job search or career advancement.